Aaina is a triangle love story of two sisters in love with the same man. Confident and ambitious Roma (Amrita Singh) captivates Ravi (Jackie Shroff) and brings him home to meet her parents and have the match approved. Shy and timid Reema (Juhi Chawla), realising that Ravi and Roma are involved with each other, conceals her sadness and joins in the festivities of her sister's marriage. Meanwhile Roma sets her sights on a glorious career in fashion and films. Ravi disapproves and Roma ditches him on their wedding day. The family is grief stricken and further shocked when Ravi suddenly decides to marry Reema instead. Reema seeing the man she loves in pain cannot refuse him and agrees to the marriage. Reema and Ravi start their married life with apprehensions but slowly Ravi discovers the true worth of Reema, and she in turn blossoms under the attention of the man she loves. Just as their marriage is becoming a beautiful reality, Roma comes back into their lives. Forgetting the pain she caused by running away she accuses Reema and Ravi of stabbing her in the back. Roma has no intentions of giving up Ravi and attempts suicide relying on Reema's selflessness and genuine love for her. This ensures that she lands in Reema and Ravi's marital home and slowly becomes blatant in making a play for Ravi. Does Ravi slowly succumb to her manipulation? Does Reema manage to fight for her love? 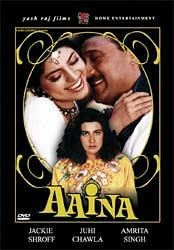 Buy Hindi Movie - Aaina DVD 1993 (Jackie Shroff / Juhi Chawla), sold & shipped by Movie Time Video where you can shop online for Pooja Mandir, Bajot, Gifts, Hindi Movie DVD / CD, Music Video.